When Cece was four, she became very sick. She had meningitis, which meant her brain was sick too. Cece got better and was able to go home, but her hearing was affected; Cece had to wear hearing aids in order to hear, and even those did not work well all the time. She really didn’t mind all that much until she went to school. There, the fact that she wore hearing aids made her feel different and alone. Until one day, Cece realizes that her Phonic Ear hearing aid, a large device she wears strapped to her chest while the teacher wears a microphone, allows her to hear conversations and events all around the school. Cece, with her super-hearing, seems to have a superpower, and El Deafo is born. 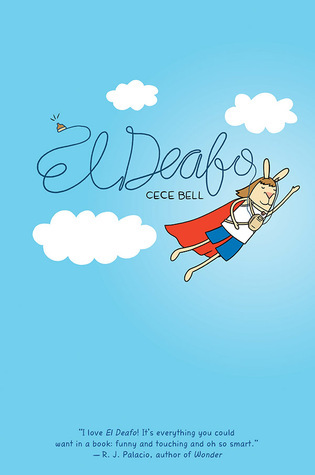 El Deafo is told in a graphic novel format, and it is based on the life of the author/illustrator, Cece Bell. Ms. Bell illustrates some of the difficulties involved for a hearing impared person living in a hearing world, such as Cece can’t lip read her friends at sleepovers with the lights out, she can’t lip read cartoons, and many people, knowing she is hearing impaired, talk to her in over-exagerated ways, which makes it harder for her to lip read them or hear them at all. However, Cece’s difficulties and her feelings of being different and alone are feelings that every child feels at one time or another. What Cece wants more than anything is to feel that she fits in, and to have at least one true friend. By the end of the book, she gains an understanding of her own self-worth, as well as an understanding that others are struggling too. She even finds her one true friend in Martha, but really, it is clear to the reader that Cece had many friends all along. This is an excellent book for younger readers. It is a book that not only removes some of the mystery surrounding children with special needs, but also shows how we’re all the same, in spite of many of our differences.